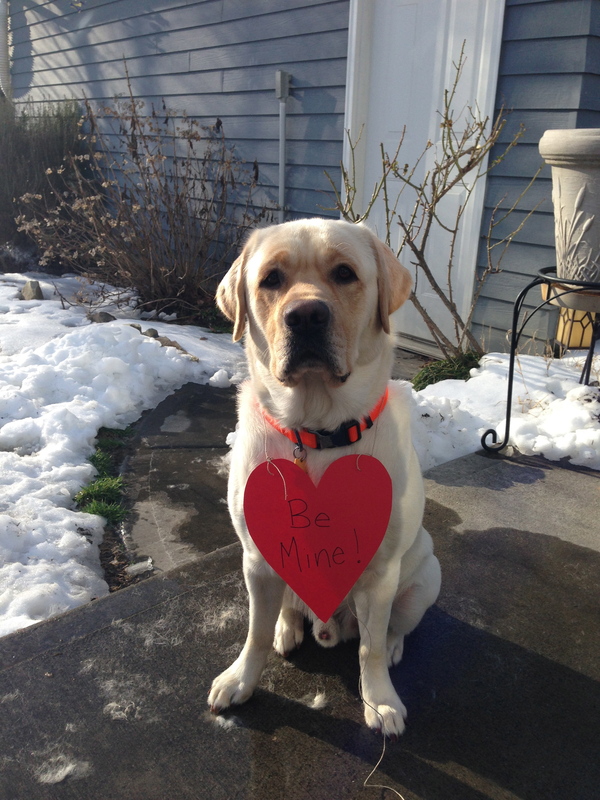 This handsome man wants to wish all his friends a Happy Valentines Day! Although he is excited for VDay, he is more excited that the sun is shining and melting away some of the snow and ice that accumulated over the past few days. We are on snow day #3 and will not return to school until Tuesday…we have walked and played in the snow, we have shoveled and swept cars and walkways and now we are ready for our lovely Charlotte weather to return:). The #snOMG storm (otherwise known as PAX) destroyed WOW week at Trinity. Week withOut Walls is a way for 5-8 grade students to have genuine learning experiences outside of the classroom. It is a week that everyone looks forward to each year. Everyone except Mother Nature this year! Teachers had planned, students were stoked and Cisco was ready to race along with my Amazing Race group but alas, we instead spent the remainder of the week at home. I really think it was one of the few times that teachers and students alike we not happy to have a snow day (or 3) at Trinity. So Cisco asked me if I would share his hipster social media awesomeness…not only does he blog…he also has an Instagram! Fancy, I know!! He requests that you follow him @tesschooldogcisco. I recently had a conversation with friends about the evolution of social media. Someone said, “I like Instagram more than FaceBook because there aren’t all the words and stuff.” Now I am an artist that finds their joy in all things visual but I am also SURE that well crafted words can paint a picture that no camera can capture. Cisco and I will do both…capture moments digitally and crafting stories with words. I must say, the boy is pretty darn cute and following his Instagram will give you a little peak into his school environment as well as vids and shots of him relaxing at home. Go to the ‘gram and follow Cisco @tesschooldogcisco. Have a great weekend! As January 6th rolled around, Cisco went back to work after two weeks of rest, relaxation and fun with new friends (I spent a week on a boat in the British Virgin Islands and Cisco spent that week with his new pet-sitter, conning him into believing that he gets to play every minutes of every day, he gets to sleep in the bed…actually, he gets to sleep on your pillow, leaving you to fend for your own night time comfort, and finally that he gets to eat when he wants, not on your silly human schedule!). 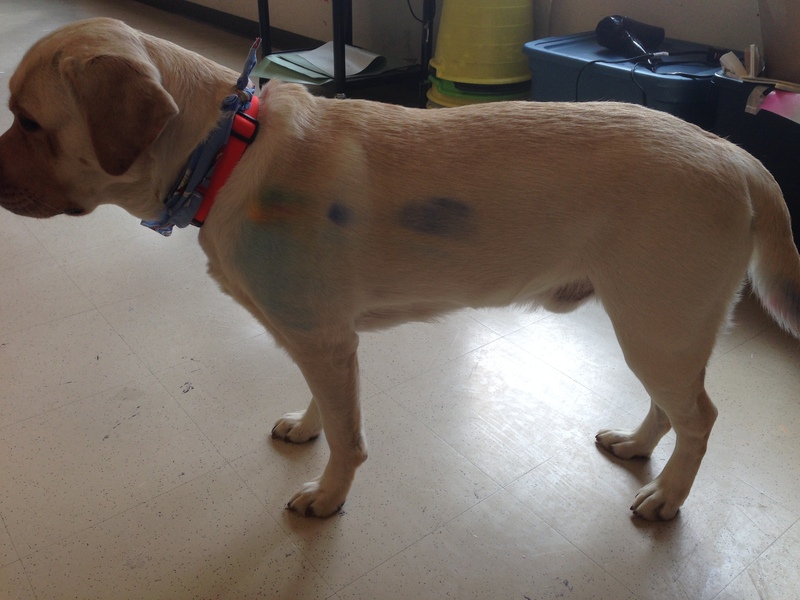 By 10 am on our first day back, Cisco wandered around the art room wearing some paint and chalk, signaling that we were officially back to work! As it is with school life, day one quickly turned to the month of January. Before we knew it January, 2014 was in the books. Before we officially turn the page to February we wanted to share some happenings from January. The morning of January 17th, my phone buzzed with the arrival of a text message at about 7:30 am. “Heads up. Patience and I are headed to chapel this morning:-)”… Patience is Cisco’s predecessor and left some big paw prints for him to fill. 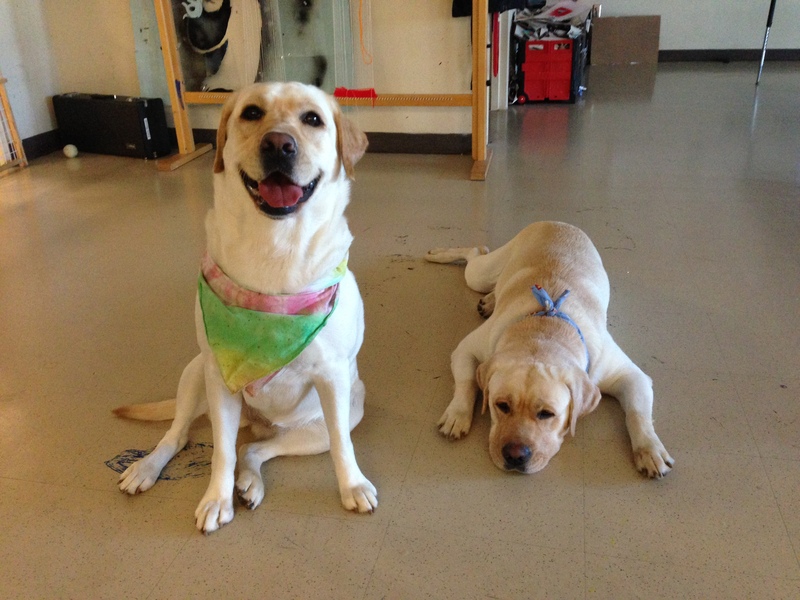 Additionally, Patience is one of Cisco’s FAVORITE dog friends. She is a bit older than him (about 7 months) and honestly, a bit more mature than him! When they are playing, Patience is the one to look at him and say, “seriously dude….that is enough!” and he simply slams his big front paws down with his booty up in the air and says, “seriously lady….it is never enough! !” He loves Patience and she loves him but they had never really “worked” together. I knew it was not going to work if he slipped into “play” mode when he saw Patience…I needed him to stay in “work” mode. I commanded him to “work” as we entered the gym but in the back of my head I wondered if my command would override his “doggie language” when he saw he friend. Like most Fridays, he was greeted with by no less that 20 eager human friends (both child and adult). He stood dutifully by me, letting each new hand give him a pat. He was so deep in “work” mode that he had not even noticed Patience…she spied him first! Side-bar: Cisco is a leash-trained school dog which means when we are out of the art room (or off the 3rd floor), he is on his leash. Patience is a free-range school dog which means she is roams within her established boundaries. Patience came bounding over to greet her friend and Cisco lit up like a Christmas tree. With a group of no less that 15 students surrounding them, these two “working” dogs greeted one another with sniffs, licks, and playful paw swats. But guess what…Cisco stayed in “work” mode! He greeted his dog friend then he turned to his students and let them continue to greet him. I breathed a sigh of relief….my boy knew what his job was, knew what mode he was in and he rocked it! 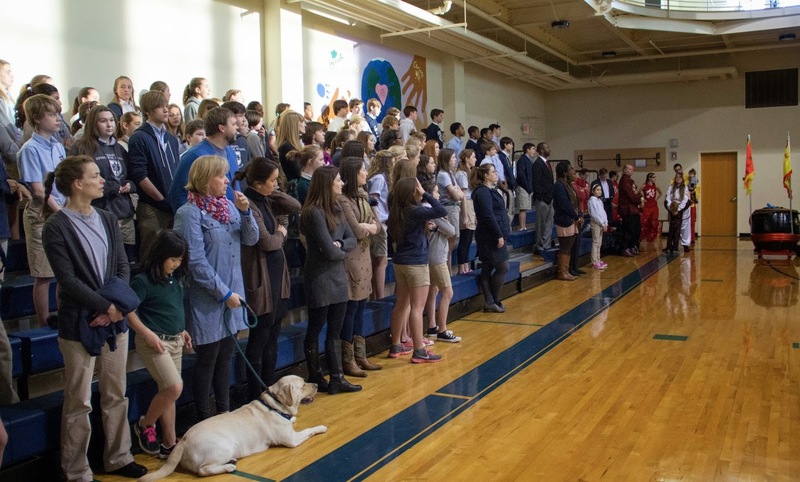 We went over and spent the rest of chapel with Patience and about 5 students that got to have hands on not one but two school dogs that morning! 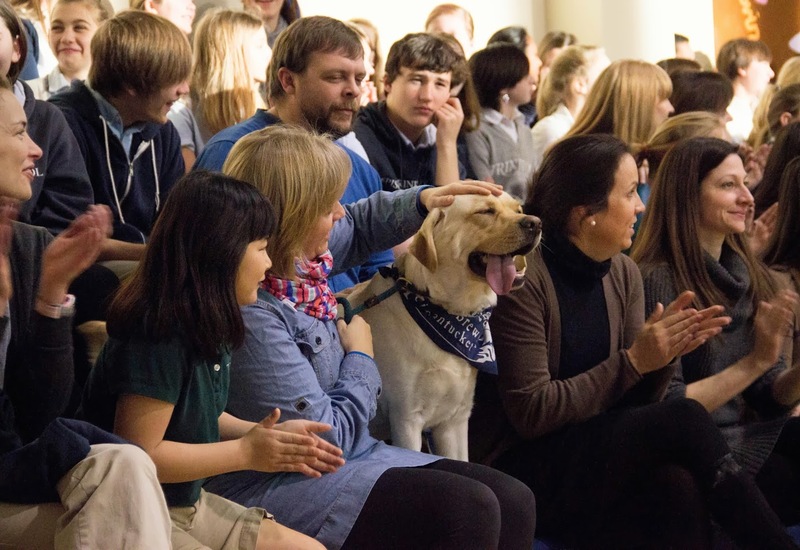 After Chapel, Patience came upstairs to the art room and hung out with Cisco and a 3rd grade class until she had to go to her new job, being the school dog at The Bilingual Preschool in Charlotte. The next week at Chapel, Cisco was called to work big time! You may remember that Cisco has been working with a student who has a very deep fear of dogs. This student has been quietly working with Cisco to move the fear to a manageable place so that it does not overcome him when he is out in the world. Both student and Cisco have made incredible strides in the few months they have been working together and Friday, January 24th they broke through to a new level of comfort and joy. The boys classroom teacher asked if Cisco could sit with the class at Chapel. This was something that had been on my mind for a while but I had not asked the student or teacher if they were willing to take this leap. I am beyond grateful that the classroom teacher asked that morning, proving that everyone (even the school dog) needs a little reminder now and then! Well, Cisco was happy to sit on the floor with this class and he quickly found himself lying on the hardwood with no less that 10 little hands finding their way to any part of his furry body they could reach. His scared friend sat on the opposite side, using me as the shield between him and Cisco. His hand would occasionally wander over to give Cisco a quick pet but he continued to keep me as his buffer. As Chapel went on, the boy became more and more confident. You could almost fell the worry and anxiety melt away as he inched closer and closer to Cisco. Soon enough, my shield was no longer necessary and as Cisco rearranged himself to a new cool spot of the floor, the boy who could not be in the same room as Cisco in August found himself sitting right next to him without a buffer, reaching a hand out to touch his soft ears, big head and squishy belly. I honestly have no photographic documentation of this event because I forgot my phone that morning (which really never happens!). In retrospect, I think it was Divine intervention. The moment was not one to be captured visually, it was one to be captured mentally. It was a moment that brought joy and love. It was a moment that all the worry, anxiety and unhappiness in the world melted away and all that was there was a boy and a dog! I can honestly say that I have no idea what the biblical message was during that particular Chapel service and I’m pretty sure that my young scared friend can’t tell you either but the presence of God was so palpable that it is a Chapel service I will not soon forget. 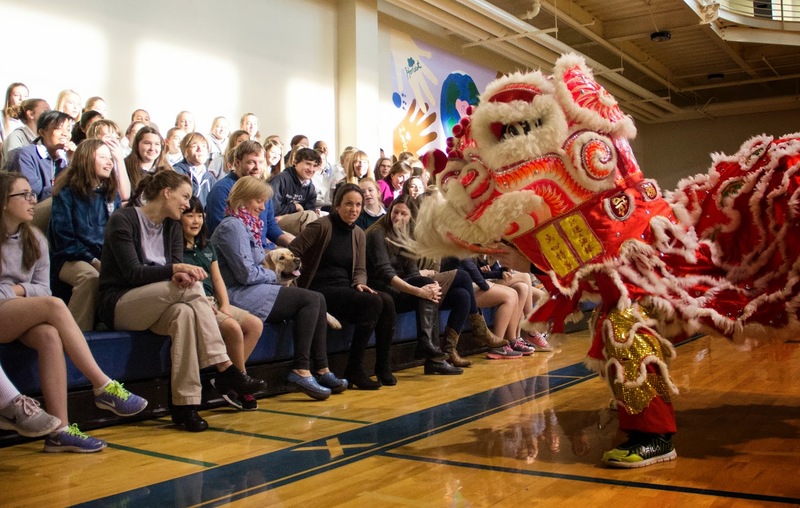 The next week we found ourselves celebrating the Lunar New Year with an amazing presentation of the Dragon and Lion Dance. The day started like any other with Cisco entering the gym to get his usual welcome from both students and adults. We found our way to the bleachers and he took his normal spot at my feet to lazily snooze on the cool hardwood floor. With the scent of some popcorn or chip left in the bleachers from an earlier basketball game, Cisco climbed up into the first level and snuggled down behind me. Knowing that his ears are WAY more sensitive then mine, I warned the young girl sitting next to me that when the guy hit the drum to start the Lunar New Year Dance, Cisco would probably jump a bit. With that, the big drum started rhythmically beating and Cisco jumped up with his paws on the bleacher next to me to see what the heck was going on! What he saw was a group of about 7 people dressed in dragon costumes performing for the community. If you have not had the chance to see a Dragon dance for the Lunar New Year you should put it on your bucket list…it was pretty darn cool. Cisco watched on with amazement and confusion…. The drum was loud and his attention was on high alert. He wanted to go investigate BAD….it took about three of us to keep him in the bleachers while the dancers got closer and closer. Their costumes were filled with feathers, pompoms, and glittery fabric that would be SO fun for him to pull apart. He wanted to dance along-side the performers, jumping and nipping at the amazing costumes but he stayed put (with the help of some strong arms). He wanted to “sing” along with the beating drum but instead just gave a few little barks. Most of the time he just watched the performers with the same amazed joy and wonder as his Kindergarten friends. As the performance concluded, Cisco again found a cool spot on the hardwood floor and slipped into his first nap of the day filled with dreams of dragon dances that included him finally ripping all the fringe off the beautiful costumes! We are sure that February will bring new and exciting adventures to share. Cisco and I can not express our gratitude properly to the school we love so. What we can do is find the beautiful moments and capture them in our heats and minds to share with the world. SO with love and admiration, we welcome 2014 and look forward to every moment! Although it is officially the Year of the Horse, in our hearts it is ALWAYS the year of the big yellow DOG!